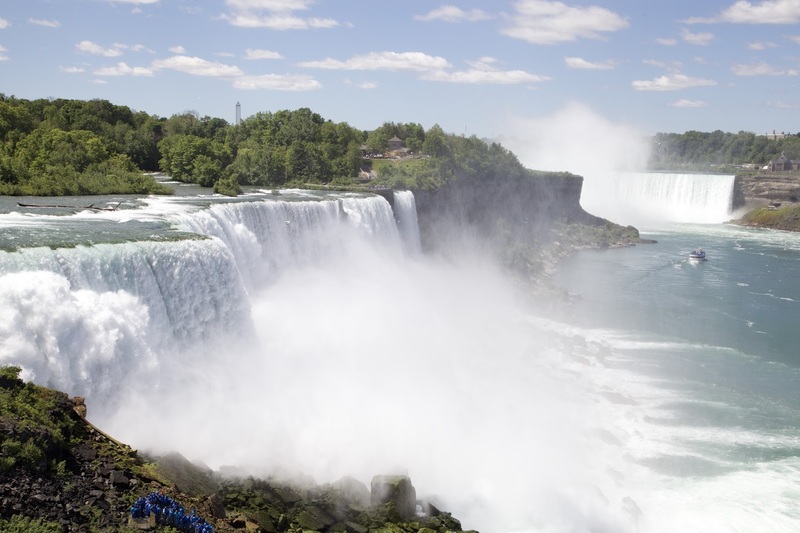 When Aaron and I went on our thirteen-day "anniventury" to Orlando, Jamaica, and more, there was one stop on our list that may have been a bit surprising: Niagara Falls. I'd never seen the falls before, and it was something that I'd always wanted to do. 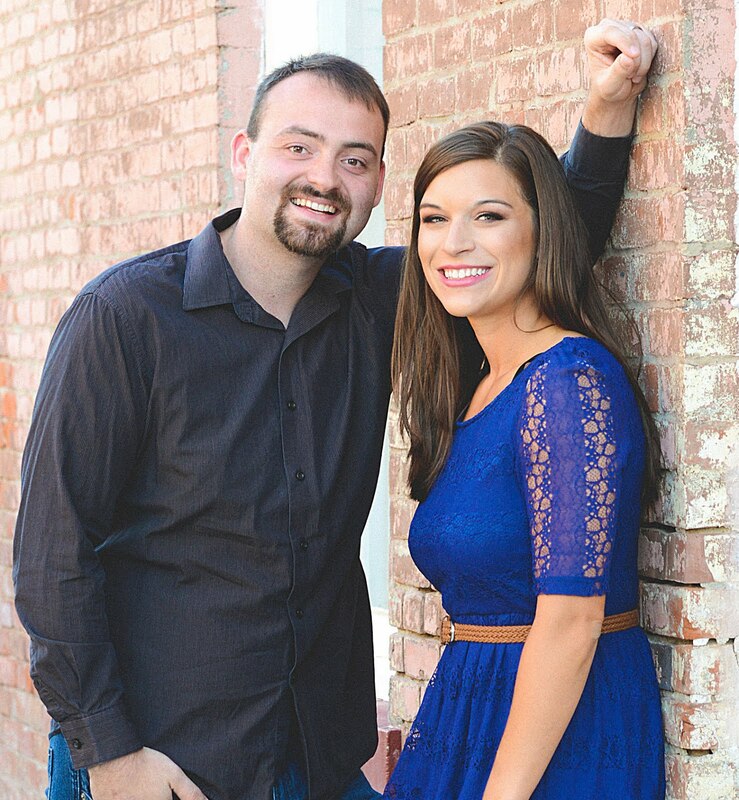 Since Aaron and I are both teachers, we didn't waste time coming home between our travel destinations; we just flew from one place to the next. 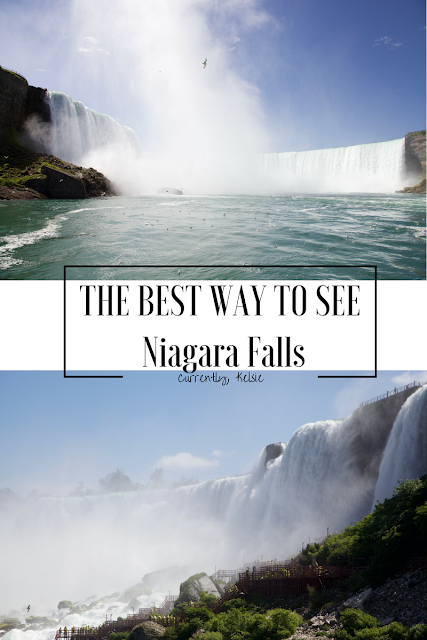 We hopped on a plane straight from Jamaica to Buffalo, drove to the Niagara area, and had an amazing, less-than-24-hour visit with a perfect view of the falls. Here's the best way you can see Niagara Falls in one day. Aaron and I flew into the airport late in the evening, but we had no trouble renting a car and driving the half hour into Niagara. If we had more time, I would have stopped for dinner in the Buffalo area, but we kept driving. Just so you know, renting a car in the States and driving across the border is very common and not hard to do at all! We had a bit of a wait at the border, but this wasn't too troubling because we weren't going to see the falls until the next day. Make sure you have your passport if you'd like to return to the States! I'm all about supporting my country with my money, but let me be real: the American side of the Falls isn't very exciting. Other than a large casino and some souvenir shops, there isn't much to see. The Canadian side is much more well-kept and has a ton of hotels and touristy activities to choose from. We actually stayed another 30 minutes past the falls in St. Catharine's, Ontario, because the hotels were much cheaper and we didn't mind the drive. When you see the falls will depend on how what time you get in. We arrived late at night, so we just went to dinner and to our hotel before getting up the next morning to drive to the falls. Since this is a tourist destination, I recommend finding hotel coupons and other discounts so you don't spend all your money on lodging. Even with this plan, we still made it back to the airport and off on our next flight in less than 24 hours. 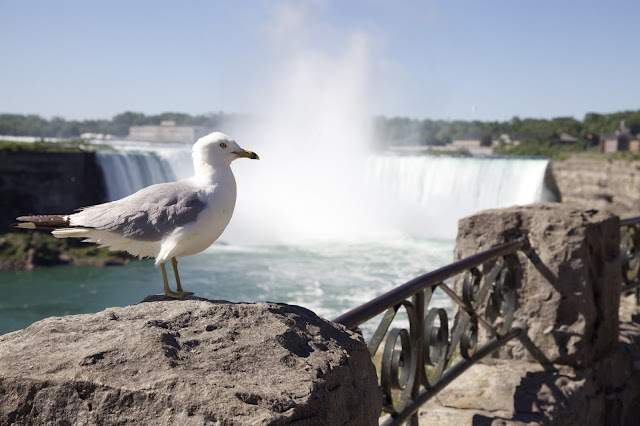 You may want to visit the falls right away when you're driving through, especially if you have an early-morning flight the next day. Parking can be expensive, so see if your hotel includes it, or use this handy website to find your best option. We ended up doing some metered parking right near the viewing area, and it was reasonable and convenient. This is easy to do, since you'll already be on the Canadian side. That being said, if you'd rather stay on the American side of the falls, you do have some options. You can walk across the Rainbow Bridge on the pedestrian walkway, but make sure you have your passport so that you can return. There is a toll to cross the bridge, either by foot or by car. You'll obviously have to cross the bridge at some point. We found it easiest to park on the Canadian side, take our photos, and then cross the toll and come across to the US to ride the Maid of the Mist! Overall, visiting Niagara Falls was a blast! We didn't need more than a day to visit, but it was definitely a worthwhile stop on our trip, and you can make it an easy stop on any vacation by following these simple tips. Since we saved money on this excursion, we're planning our next trip. We might head to Las Vegas and check out the shows in Sin City. Happy traveling! Yes, yes, yes!!! When we went two summers ago, we made sure to see the falls from both sides. We did a Maid of Mist tour as well! Isn't it such a fun place to visit?? It was gorgeous. Always a place I had wanted to see! Love Niagara falls especially at night! I love how they light it up at night! Great tips! Even though we live in the northeast (PA), I have never been there. Definitely on the list and would be a good sort of "long weekend" trip! It definitely would be a good weekend trip! I am based in Canada and, I agree. The Canadian side of the falls is beautiful. One time of year when it is great to visit is during winter when they project the coloured lights on the frozen falls at night. Breathtaking!! Awesome! It was beautiful from the Canadian side! I think the falls are SO beautiful, I'm dying to go!! I might road trip with the hubs from PA. Ha! You definitely should in the spring! Because Buffalo is my hometown, I had to click and read this. Love that you enjoyed your experience at the Falls! Lovely to know people enjoy visiting and enjoy our city as well! The Maid of the Mist is definitely an experience all on its own. Oh yay! We enjoyed Buffalo. Maid of the Mist was SO fun! This sounds like so much fun! Niagara Falls is definitely on my bucket list and would love to do it soon. It was on mine too, and was super fun! 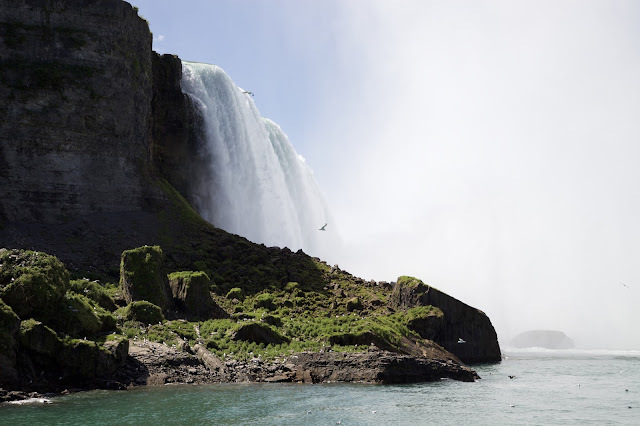 You do know that Niagara Falls is one of the top honeymoon destinations, right? It's super romantic and all! I'm glad you got to see the falls from both sides. 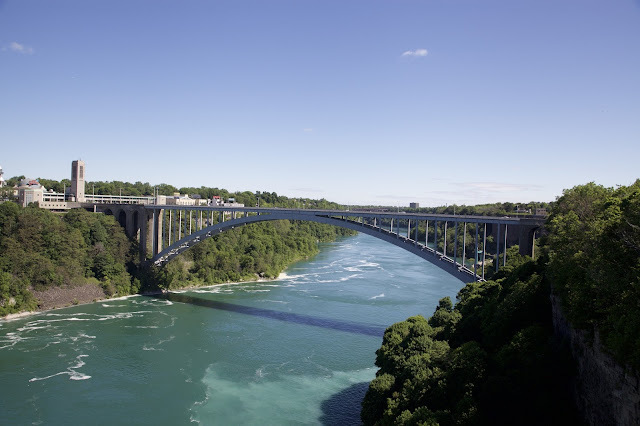 Many people don't cross over into Canada and it's a shame because the views are really spectacular! Glad you had a fantastic time! Your photos are stunning! I didn't know that! So awesome. Yes, you've got to go to Canada! And thanks! if you ever get back over to Niagara Canada, take a quick 15 minute drive to Niagara on the Lake for some wine tours! Maid of the Mist was a blast! I loved viewing from the Canadian side! I've been to Niagra Falls once and it was so crowded, but this makes me want to go back to see it again! It wasn't crowded at all where we were! That sounds amazing! We had a great time on our anniventury. Seriously wish I was able to go to Niagara Falls when I lived in NYC. It wasn't that far from me...well at least compared to where I'm at now (west coast). Amazing photos and thanks for the tips! It was so great! Thanks for reading! 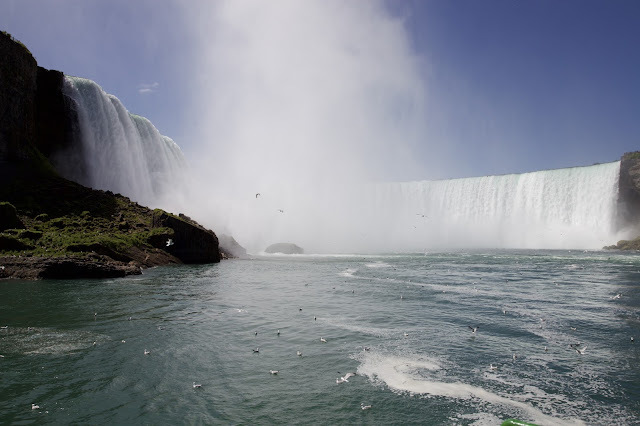 I remember visiting Niagara Falls when I was arounf 12 years old. I loved the experience and I really want to go back. I remember that we wanted to stay at an hotel but it wan't possible I was so bummed. Thanks for the tips. We went to the Falls for the second time this past summer and decided to cross the border into Canada. You're right, the view was so much better plus the Canadian side has a lot more to do! We went to Canada on the Lake too, a quaint little town with lots of cute shops, restaurants, and wineries. It's about a 30 minute drive from the Falls, but was my favorite part of the day. Kind of reminded me of Charleston or Savannah. Definitely plan to go there again one day! I've heard great things about Canada on the Lake. Next time for sure! Wow! You got some gorgeous photos, Kelsie! I sure hope I get to see this in person someday. It was so beautiful there- definitely worth a visit! So fun! I know what you mean, they make you feel kind of intimidated ha. But overall, it's pretty easy! I love Niagara Falls! I've been twice, but I was pretty young both times, so I'd like to go back. I agree, The Maid of the Mist is a must-do! It was such a blast! I was laughing the entire time, and the ponchos are definitely needed ha!